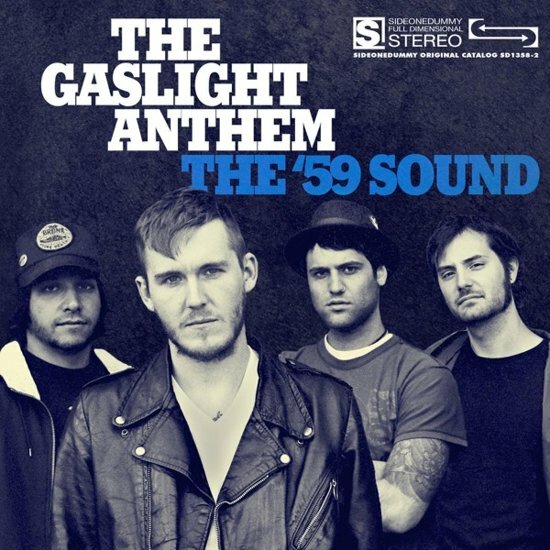 Bruce guests with The Gaslight Anthem on "The '59 Sound", the first time he has played the song. Brian Fallon recalled, "He just showed up. That was it. Nobody knew about it, nobody said anything, and he showed up an went, "Can I play with you ? "and we were, like, "Absolutely. Yeah. All right." It was literally three minutes before we went onstage. 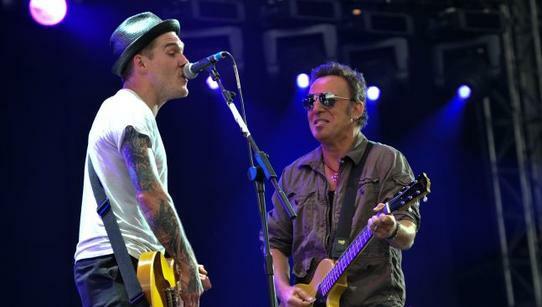 Bruce once again appears with The Gaslight Anthem during their afternoon performance at Hard Rock Calling. In 2009, the Gaslight Anthem supported Social Distortion on their European tour and was announced as a supporting act for Bruce Springsteen at Hyde Park Calling. The band performed at Pinkpop on June 1, 2009. At the Glastonbury Festival on June 27, 2009, Springsteen joined the band on stage during their performance of "The '59 Sound." Brian Fallon later contributed to Springsteen's headlining set, performing the song "No Surrender." At London's Hard Rock Calling festival on June 28, Springsteen again joined the band to perform "The '59 Sound", and Fallon again joined Springsteen in singing "No Surrender." "The '59 Sound" is a 2008 song by American rock band The Gaslight Anthem. Written by the band and produced by Ted Hutt, it is the title track of the band's second full-length album. Released as the album's lead single. The '59 Sound" was the first song written by singer-songwriter-guitarist Brian Fallon for the band's 2008 album, also titled The '59 Sound. Fallon recalled, "I never wrote a song like that before. And I thought it was better than anything else I ever wrote. I showed it to the guys [in the band] and they thought it was awesome. Then the next one was "Great Expectations" and we definitely knew where we were going with [the album]." Fallon said the band had tried to emulate the sound of soul music from the late 1950s, because "back then it seemed like there was a genuine feeling of excitement going on that I don’t think is necessarily happening right now. It seems like when you look back on that era a lot of it is embodied in that Memphis sound, so it’s just a giant celebratory thing. In June 2011, band dedicated the song to the memory of Clarence Clemons during their set at the 2011 Glastonbury Festival. Clarence had died that same month. "And Brian, I know Brian Fallon from The Gaslight Anthem, he was a fan but he does something, he just manifests something that's completely his. I've played with his band onstage a few times and I love doing it. It's just wonderful. We played in Asbury Park at Convention Hall one night and we did "American Slang" and it was just great. You hear little bits of [your music in other songs] but then they take it to another place. They take it to a place where you wouldn't have taken it, you know. And that's what you hope for." "It was what it always was, come to manifest. It was everything I was going for, and I knew this was my opportunity. It might be my only chance. For me, it was sheer and utter determination to not fail in front of those people. This might be my only chance to speak my voice and get my emotion across. I didn’t care who was watching and how many people were there. I didn’t even care what the E Street Band thought. Bruce invited me to do this thing and give me a chance to put my flag in the ground, and that’s what I’m going to do. And it was super scary because if you do mess up, you’re messing up in front of, essentially, the world. To me, the [actual] world didn’t matter, that was the world I was looking for. That was the world I was trying to reach. The people that would take an artist like Bruce Springsteen, look at him, and go, "I relate to that." It was my future in the balance. I was going out there and representing everyone that I was working with. I was representing the band. I was representing Bruce in a way, and his taste. I’m representing a song. I’m representing my parents, who’ve allowed me to do this. I’m representing all of this." Did you hear the '59 Sound coming through on Grandmama's radio? Did you hear the rattling chains in the hospital walls? Did you hear the old gospel choir when they came to carry you over? Did you hear your favorite song one last time? And I wonder were you scared when the metal hit the glass?